This morning, my grandfather passed away. Robert K. Greenfield was ninety-seven. He lived a long and interesting life, and he had a real impact on the world in which he lived. When I was in sixth grade, I was given an assignment to write about a modern day Renaissance Man. I wrote about Bob and his knowledge and interest in countless areas — law, tennis, wines, public policy. At the time, he was seventy-four and seemingly winding down his life. Little did I realize that he still had more to accomplish than most of us do in our lifetimes. I’d like to share a few thoughts with you, and hopefully give a little something back. You have played a considerable role in shaping who I am, and you will continue to do so, no matter what happens with your current condition. Most people give up at some point or another. They try unsuccessfully to change things, and become cynical. They get worn down by the grind of life around them, and become indifferent. They succumb to greed, and become corrupted. They lose the discipline to take care of their bodies, and become slothful. They lack the intellectual rigor to seek truth, and become mentally lazy. You aren’t like most people. I am in an industry and a world that’s very different from the one you inhabited when you were my age. I sit in front of a computer all day; I solve algorithmic and mathematical problems, trying to construct a product that helps to bring people together; I try to stay as far from the legal world as possible! I am very much a product of my generation and my background: an Internet geek who lives in San Francisco, has traveled around the world, has no kids at age 30, and spends at least ten times as much money on food as on gasoline. And yet, I cannot help but look to your example as a guiding force in my own life. Elaine and I see your 71 years of loving marriage with Mommom as amazing, and something we aspire to (if we’re lucky enough to live that long!). We were so glad you made it to our wedding, and honored by your kind words there. I am continually impressed by the strong foundation you’ve built with the Goldsmith Prize. The more I learn, the more I realize how difficult it is to set up something like that, and the Goldsmith Awards have been an unbelievable success. Your combination of creativity, foresight, diligence, and personal relationships have uniquely crafted something special. I will work hard to build on the Goldsmith successes, but it goes beyond that. I also use the Goldsmith model every day in my life: today I try to create a project of similar magnitude in the Internet world; tomorrow I may look for the next big thing in the world of philanthropy. Thanks to you, I’ve gained great insight into the process of creating something substantial, and a big boost in the inspiration needed to actually do it. There aren’t a whole lot of people who can make me feel guilty for not working hard enough, but my 93-year-old grandfather is one of them. Your discipline, hard work, professionalism, attention to detail — I could go on and on — are astounding. I didn’t realize that when I was a ten year-old kid, but at a certain point I realized that your successes — academic, professional, family, athletic — were not the result of happenstance. Many successful people get ahead by cutting corners, by sacrificing their principles or the common good. But that’s also not you: your honesty, your sense of fairness, your (stubborn!) desire to stick to the rules keep you grounded, and are yet another reason you serve as an inspiration to me and the rest of our large family. The ongoing trend in your life has been to look beyond what’s easy, and instead do what’s right. My words are a mediocre expression of my sentiments and appreciation for all you have done for me and my family, but I hope they give some small sense of the effect you’ve had on my life. That effect will last as long as I will — thank you. Fortunately for all of us, he lived another four and a half years. This past June, with dozens of family members, we celebrated 75 years of marriage between him and my grandmother. He got to meet my daughter a few months after she was born last fall, and then again before he died this month. Amazingly, he was an avid reader of this blog. In his typical self-deprecating fashion, he explained how difficult it was for a “twentieth century mind” like his to understand the new things I was writing about. I know that wasn’t true. The last time I saw him, less than two weeks ago, he was physically tired but mentally sharp. 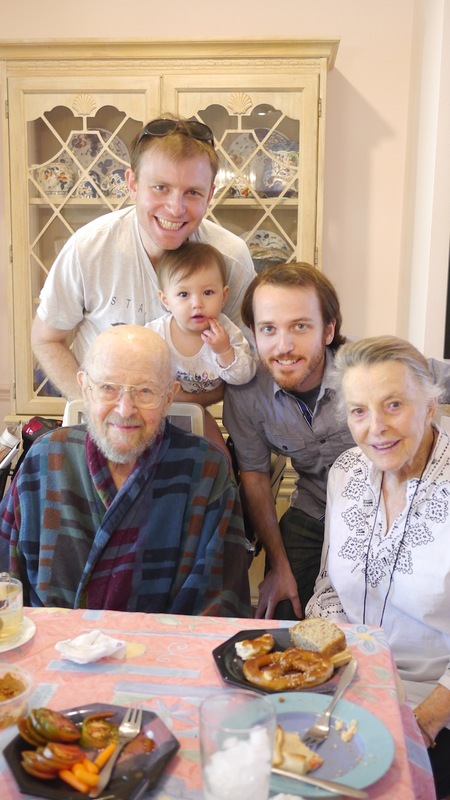 He was trying to figure out how policies around the fiscal cliff might affect his family, he was doing what he could to help with intra-family disagreements, and he recounted countless stories from nearly a century on earth. Aside from the combination of physical frailty with mental sharpness, two memories from my recent trip stand out. One memory is my grandfather’s awe at the possibilities that exist in the modern world. I shared some of my own startup experiences, and he explained how he wished he’d been able to do something similar. Bob certainly had an entrepreneurial mindset — after he retired he set up the Goldsmith Prize — but his day job as a lawyer was much more cut and dry. I’m incredibly fortunate: I live in a time and place where I can dream big dreams and run with them. Every day, I try to bring to my projects some of my grandfather’s intelligence and tenacity. The second memory is a more personal one: my grandparents spent much of their time on the couch next to one another, savoring their final days together. My grandmother asked my grandfather if he still remembered their first kiss; he said he did, but amazingly their stories diverged. I feel sad for my grandmother: she’s only 95, with years of sneaky tennis drop shots ahead of her. But it was amazing to witness that kind of love after more than 75 years, and I’m glad that their four kids, fourteen grandchildren, and seventeen great grandchildren saw it and benefited from it too.